Have you ever been to the donut shop and you just can’t decide which donut to buy? They all look so good! That’s how it can feel when trying to choose a paint brush. So many options. So many shapes and sizes. How do you know which one to get?? I carry three kinds of brushes that I call Good, Better, and Best. Let’s start with the Good brush. 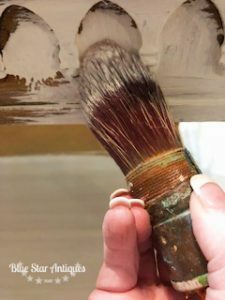 This may look like the cheap chip brushes that you can find at your local store. But there’s a big difference! The cheap chip brushes are made with natural bristles that not only cause brush strokes, but they tend to fall out. 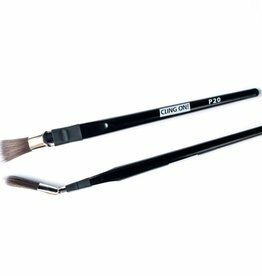 The Fusion ‘s basic brush contains synthetic bristles and gives a wonderful finish. It comes in two sizes, 1 1/2″ and 2″. 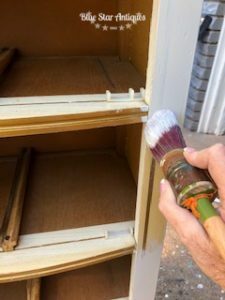 We use these in our workshops and I frequently use them around the house on small projects. These are a good choice for small, simple designs. 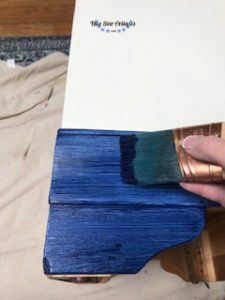 The angled brush is a better brush than the basic brush. This one also has synthetic bristles and leaves a beautiful finish. The quality of the bristles, the larger size, and the angle of the tip all make this a better brush. It’s great for kitchen cabinets and pieces that have a combination of flat and inset or raised panels. Our BEST brushes are the premium quality, professional level Staalmeester brushes. 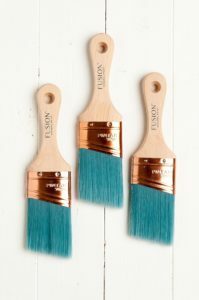 These are not your average hardware store brushes. These are the Rolls Royce of brushes, designed to last a lifetime! The bristles are a unique blend of synthetic and natural bristles. 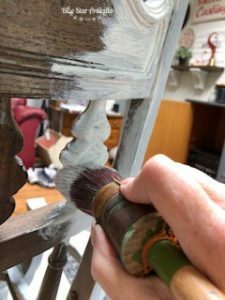 The natural china bristles help the brush absorb and hold paint while the longer, silky synthetic bristles provide a smooth, even application for little to no brush strokes. Each Staalmeester brush has a beautiful beechwood handle and striking copper ferrule. The bright orange string surrounds the base of the bristles and keeps them tight and in shape. You should leave the string in place. 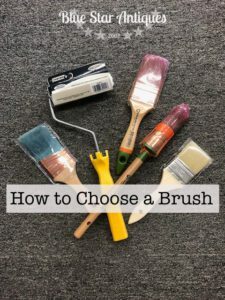 The most frequent question I get is, “Which brush should I use?” Let’s look at each one. The large Staalmeester oval sash brush is the most versatile. If you only buy one brush, this would be a good one! I’ve probably painted 3/4 of my pieces with this brush. The large diameter flattens out some when you brush, providing a wide, flat surface that is great for flat surfaces. The round shape also helps to access groves and cover spindles. 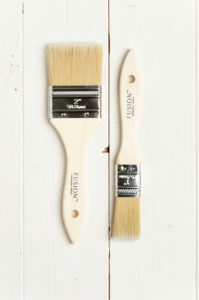 One of our best selling brushes are the Staalmeester pointed sash brushes! This pointed brush is perfect for getting into corners, edgework, and cutting in. It, too has great flexibility. 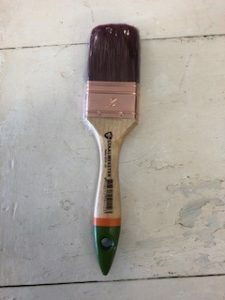 When I mention paint brushes, most customers picture a flat brush. 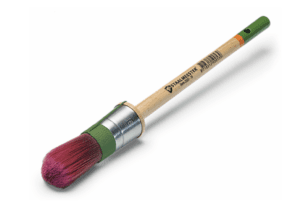 Staalmeester’s created a wonderful flat brush that comes in three sizes, 1″, 1 1/2″, and 2″. The Staalmeester flat brush is great for a flat surface. This would be my choice for a flat surface like a small table or dresser without much detail. Fusion just released a new brush that has become my favorite! This one is the Staalmeester round synthetic brush. What sets this one apart is that it contains only synthetic bristles – no natural bristles here. How is that different? It is soft and makes painting a dream! 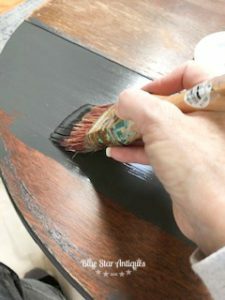 It is so easy to apply paint with this brush. And clean up is super easy too! This one has a green string around the bristles to set it apart from the other brushes with an orange string. The last brush in my lineup is a funny looking brush. It’s called a Bent Radiator brush and this one is made by Cling On. It, too, is a synthetic bristle brush. But why the bend? It’s a speciality brush that helps you reach those hard to reach spots. I don’t use mine often, but when I do, this one is indispensable. When you purchase a brush, the best way to keep it clean and conditioned is with the Fusion Brush Soap. I’ve found the easiest way to clean the Staalmeester brushes is four simple steps. 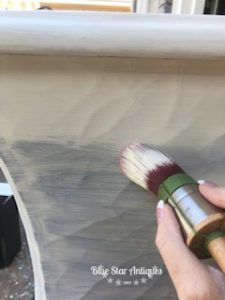 Rinse most of the paint out of the brush under running water. Here’s a video showing how easy it is to clean. One of the secrets to achieving a flawless finish is to use a quality brush. 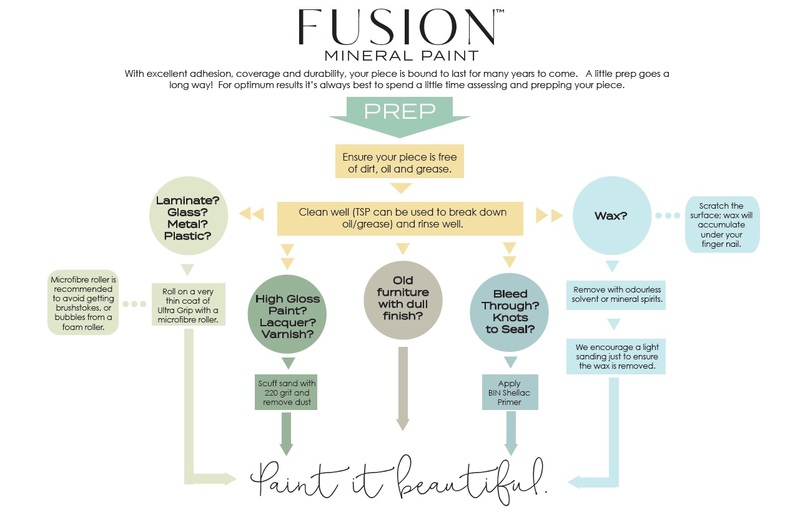 Once you’ve selected your brush and paint color, it’s time to prep. 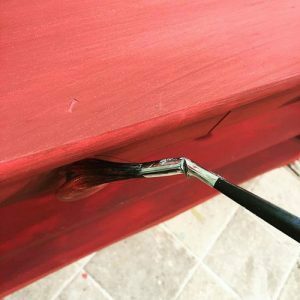 You can see the steps to prepping for a quality finish here and download a free copy of the prep card! I have a large bucket full of brushes that I’ve accumulated over the years. It’s important to have the right tool for the job. That’s why I’ve put together this starter kit. 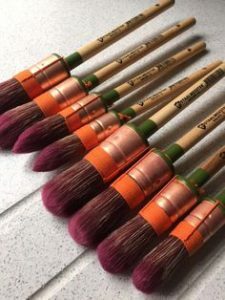 It includes my favorite Staalmeester round synthetic brush, the large pointed sash brush, and the medium flat brush plus a tube of brush soap to help you take care of your new brushes. You can purchase a starter kit here. I’m always happy to help with any questions you have! 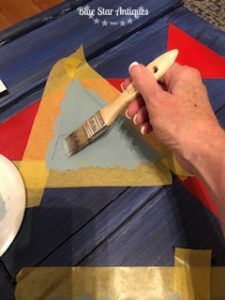 Let me know where you are in your painting journey! I never have and don’t mind checking into that for you but I have friends in the UK that carry Fusion and can find people that carry IOD if that’s what you need.